​So I've been observing people play through the Adventures of Chris demo, taking notes, making adjustments, recording feedback, and it's been an incredibly useful process. I suspect this is one of those lessons that should be obvious, but that I nonetheless have had to learn the hard way - if I tune the difficulty to be a fun and engaging challenge for MYSELF (the programmer), it's likely to be WAY too hard for anybody else. Sometimes this is a function of making assumptions on my part - I know what I expect the player to do, what the enemy patterns are, etc. - but there's no guarantee other players will understand the intent. In a way, it's kind of embarrassing. Watching players struggle against early bosses that are supposed to be a cakewalk, it's easy to feel like a failure as a designer. Fortunately, I've discovered that I'm in good company when it comes to this sort of thing. Sakaguchi: At first, getting through the game was tough. The testers were saying "You guys are being cruel. Whose idea was this?" It was mine! *laughter* Harsh, right? Horii: We developers had managed to make the game too difficult! Sakaguchi: It's always like that the first time, no matter what. Horii: It's because we know too much. The developers think the game's just right, that they're being too soft. They're thinking from their own experience. The puzzles were the same. Lots of players didn't figure out things we thought they'd get easily. Sakaguchi: There were exceptions to where people got stuck, though. 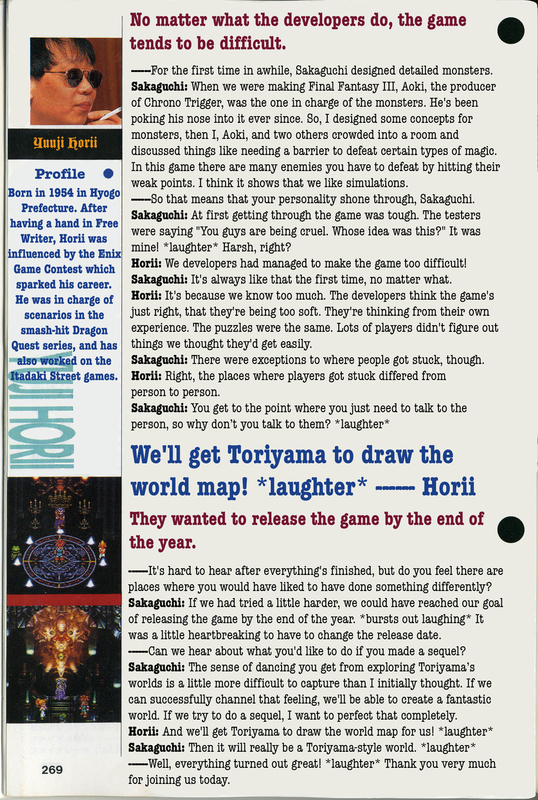 Horii: Right, the places where players got stuck differed from person to person. (This is actually a big comfort to me. If the expert, professional designers of some of the most beloved games in history had trouble tuning the difficulty at first, then I think maybe it's ok that the Adventures of Chris demo started out too intense. I'm in good company! In other news, people have been responding very positively so far to the art and dialog, as well as the music. I'm excited to make more progress!